Mile by mile, city by city it moves leaving in its wake a path of destruction. The Pentagon calls Major General Slater (Richard Widmark) and Major Baker (Bradford Dillman) to investigate the invasion of a secret ICBM site in Texas. 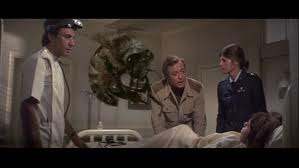 They arrive at the base to find the entire crew dead except for Dr. Brad Crane (Michael Caine). Crane explains that the men died, not from enemy fire or poison gas dropped by the Soviets, but from bee stings. Crane sends for Dr. Walter Krim (Henry Fonda), beeologist, who claims the war they’ve been expecting has arrived and sets to work doing autopsies and testing venom. And you thought ants could spoil your picnic. In this man vs. nature film, the military refuse to believe the scientists or do very much until some picnickers die violently at the hands of bees. Do bees even have hands? Then bees overrun a Mayberry-like town filled with old Hollywood stars which puts a damper on Olivia de Havilland’s annual flower festival. She and her suitors Fred MacMurray and Ben Johnson along with the rest of the town board a train to look for a town without bees. Cue Gene Pitney. 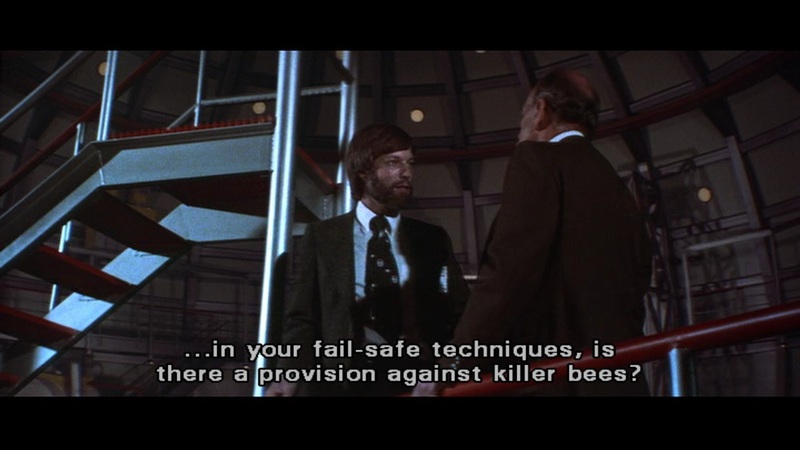 Meanwhile, back in the lab, Dr. Krim experiments with his bee venom antidote and we meet Richard Chamberlain and José Ferrer for some reason. Scientists and airmen make plans, bees foil those plans, and things blow up…a lot. No one knows what to do until Dr. Crane stops ogling Katharine Ross for a second. Oh, she’s in this film too. Crane has a weird and brilliant idea ‘that just might work’. More stuff happens. The end. 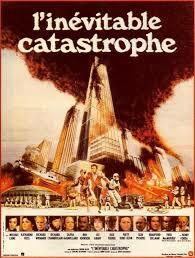 Irwin Allen, directed The Swarm and directed and/or produced many of the best disaster films of the 1970s. He produced The Poseidon Adventure, The Towering Inferno, The Night the Bridge Fell (? ), and The Swarm with big budgets and big, star-studded casts. From Errol Flynn to this? Along with the actors I mentioned, The Swarm also stars Lee Grant, Slim Pickens, Patty Duke, Cameron Mitchell, and Alejandro Rey. I enjoy seeing so many A-listers all in one place, but I have to wonder if the Screen Actors’ Guild had a 2-for-1 sale or something. Jerry Goldsmith wrote the music and Stirling Silliphant and Arthur Herzog wrote the screen play based on Herzog’s novel. I like The Swarm. It has a 70s dream cast, decent bee effects, and fun dialogue. At one point a helicopter pilot screams “Bees, bees, millions of bees!” right before crashing into a mountain. Dr. Crane remarks after a failed attempt to destroy the bees that “They seem to sense it’s something that will kill them.” Really, Brad? Later Richard Chamberlain says, “They’re brighter than we thought.” Henry Fonda replies, “They always are.” Wise words, Hank. The film also boasts Bradford Dillman as an Air Force major trying desperately to decide what sort of accent he should use. He tries several so it becomes sort of a game to predict how he’ll sound next. A bunch of guys get covered in bees then catch fire and fall off buildings which is always fun. 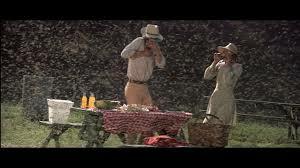 People who are stung also see other people as giant bees. Maybe the bees ate the brown acid. Second word. Sounds like me? Anyway, if you like 1970s stars, flame throwers, or bees, you’re in luck. The Swarm has all those and Michael Caine emoting all over the place and saying “Four minutes to flaming.” It’s a lot of fun. I watched a making of segment on the DVD and apparently Irwin Allen took care of the actors and stunt people. He spends a lot of production time making sure they have the proper equipment and checking their condition after each shot. Fire and live bees, after all. Oh I almost forgot the disclaimer. I had to take a screenshot of this. Some of my best friends are bees. I do love your humour which is really the only way you can write a post on the Swarm. I do love the cast in this and I do love Michael Caine and Lee Grant in these kind of movies. shame they didn’t do a sequel with another load of A-Listers. Do love an Irwin Allen film!